Is the government doing what it promised? 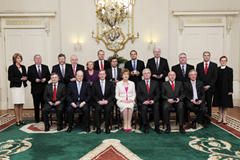 The programme of the government that took office in March 2011, entitled New Government for National Recovery 2011–2016 (PfG), committed to addressing a wide range of political reform. The reforms were to enhance accountability, to make the Dáil more efficient and productive, and to bring more of the administrative infrastructure of the state under Dáil surveillance. David Farrell’s early assessment of PfG political reform proposals – in late 2011 – gave a relatively positive view of the progress made with some reforms fully implemented, others ongoing, and some still at the promised stage. A year later arguably much more has been done. Progress to date is examined in the accompanying checklist (commitments to reform of the public sector, while relevant to political reform, are not considered for reasons of space). However, it can be argued that quality is perhaps sacrificed for quantity and much of the reform is not substantive. Seasoned observers argue that pre-election promises made by the Government parties have amounted to little of substance, that PfG commitments have been delayed and often watered down and that political reform to date amounts to incremental, tinkering changes. It is hard to argue that there has been a significant remedying of the faultlines and dsyfunctions in our political system that directly contributed to the crisis. The measures taken are necessary but not sufficient reforms for remedying the degree of dysfunction in existing institutions. The Constitutional Convention (CC) is to start in September. Constitutions usually have three legs: symbolic statements of values, civil, political, social and economic rights of citizens, and rules governing the distribution and exercise of power in political institutions. Despite its clear limitations the Constitutional Convention is an opportunity to make progress on all three. Debate about the agenda has so far been dominated by the first two. There is a danger that the Constitutional Convention may act as a smoke screen that blocks debate about fundamental political reform concerning governance and political institutions and ultimately our capacity to govern ourselves. Peadar Kirby and I have argued it was the interaction of Irish political institutions, interests and ideologies that produced the unsustainable Irish variety of capitalism that collapsed so spectacularly in the global crisis of 2008. Our political institutions were the foundations from which we built the Irish political economy model that rendered us so vulnerable. Niamh Hardiman argues Irish institutions are not only problematic but also resilient and resistant to meaningful reform. It is worth noting that some key political reforms do not require constitutional amendments to be progressed. Relevant political reform must directly address the core questions of the exercise and distribution of power but reforms to address our clientelist culture, local government, the separation of executive and legislature, the capacity of government, and diversity seem sidelined. The late Peter Mair used the phrase ‘amoral localism’ to capture the dysfunctional culture of Irish politics. Short-term electoral pump-priming has been an increasing feature of our political culture and a direct cause of the unsustainable fiscal deficit. While the establishment of the Fiscal Council in 2010 may partially address this, the dysfunctional nature of a clientelist and populist political culture could also be addressed through electoral reform for both local and national government. This is crucial as it is the paradox of highly-centralised governance and localised multi-seat constituencies in the Proportional Representation Single Transferable Vote electoral system that they create a unique political structure that serves to veto reform. The dire need for devolution, meaningful local-government reform and local revenue-raising powers reflect another faultline. Local government reform to date has been disappointing and even if the PfG was implemented in full it would transform little. Nor is the PfG likely to transform the functioning of our national parliament. Greater separation of power between the executive and the legislature could widen the pool of potential candidates for ministerial appointment and perhaps heighten clarity to the advantage of the legislative branch. Options that have been proposed range from complete separation as in the US model to simply facilitating more external appointments (for example by facilitating Seanad appointments to the Cabinet). The capacity of central government departments is another key problem. The crisis shone a spotlight on the Department of Finance, with a consequent decision to split that department with a new Department of Public Expenditure and Public Sector Reform. However, incapacity of government departments appears to be systemic. The gap between policy-making and policy-implementation has been described as ‘implementation deficit disorder’. Recent proof of such disorder can be seen in the debacles of the household charge, septic tank inspection, turf-cutting, health reform, and construction standards. Niamh Hardiman argues for more effective delegated governance and more accountable public-sector management. Group think across our political culture was identified as a core contributor to the crisis. Diversity has been identified as one remedial mechanism. Increasing the number of women at senior levels is one political reform that has been long overdue and which was recently advanced as legislation. But meaningful implementation will be key. Many still hope that the crisis might provide the opportunity for real political reform. The next decade of commemoration offers still more opportunity. It will be up to citizens to demand such change from below and to demand better political parties and leadership. Groups like Claiming Our Future and Second Republic have created space for citizens to explore and promote political reform. Maintaining the same political fissures means the next crisis is guaranteed.